The Central Regional Office of the Food and Drugs Authority (FDA), in collaboration with the Regional Police Command, has arrested seven men suspected to be dealers in and manufacturers of unregistered medicines in the Cape Coast Metropolis. 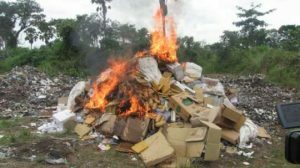 They were arrested from various hideouts and information centres in Adisadel, Nkanfoa, Ntranoa, Amamoma, Asenadze and Essuekyir in a swoop on Friday dawn where they had openly displayed the medicines amidst loud audio advertisement selling to the unsuspecting public. The team seized a total of 1,285 assorted local aphrodisiacs of 11 different brands. Some of the medicines were concoctions that had no labels on them to indicate the kind of ingredients used in their preparation and had no directions detailing the right usage. Mr John Odai Tettey, the Regional Head of FDA, in an interview with the GNA after the exercise, said the medicines were not registered by the FDA and were not supposed to be sold on the market. According to him, the move formed part of a sustained effort by the FDA to clamp down on dealers of unwholesome products to safeguard the lives of consumers. The FDA, he said, would continue to protect public health by ensuring the safety, efficacy and security of human and veterinary drugs, food, biological products, cosmetics, medical devices, household chemical substances, tobacco and conduct clinical tests. As part of its mandate, the FDA would continue to regulate, check, monitor and seize all unregistered, fake and substandard medicines and medical devices supplied to hospitals, pharmacies and all unauthorised places throughout the country, he said. He said the swoop was an ongoing process, which would be sustained to safeguard the health of the public and called on the registered herbal companies and the general public to report any suspected fake medicines on the market to the Authority. The post FDA arrests drug peddlers, seizes 1,285 unregistered products appeared first on Citi Newsroom.